Celebrated all over the US, Thanksgiving is considered one of America’s favorite holidays. Different areas in the United States have their own way of celebrating Thanksgiving, and families also tend to have their own traditional dishes they like to prepare. No matter how you celebrate or who you celebrate with, one thing remains the same for every household; Thanksgiving is a time to chow down. But that’s the easy part. The difficult part is preparing the feast while watching out for those little hands stretching to get every little bit of delicious nibble they can get their hands on. How do you keep those little hands busy? Keep them occupied with these fun and creative printable dinner placemats and origami designs, while you prepare a tasty meal. Once everything is downloaded, printed out and passed around, it’s time to get creative… and very colorful! We know that kids have big imaginations. We sometimes forget just how much joy and creative fire they can muster. A Thanksgiving themed origami and coloring exercise is a great way to ignite their creative fuel and make good use of your printer and ink cartridges. What fun and unique images will they create? After they are done coloring their placemats, make sure to set them on the area where they will be sitting for dinner in order to reserve their spot. 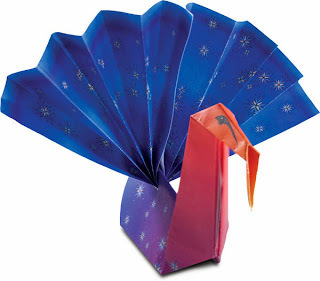 When everyone is finished recuperating from a full stomach, enjoy some great puzzles and games on the reverse side of the placemats or take the time to form more origami turkeys. The CompAndSave family puts great emphasis on togetherness and giving thanks for what you have. Remember to keep those the origamis and placemats as a memory of the enjoyable and happy time you shared with your family. For more tips on how you can enjoy the holidays, subscribe our mailing list and connect with us via Facebook to let us know what you’re thankful for.